Larkhay WI meet on the 2nd Thursday of every month (except) August at 7.30pm. We have lots of different speakers on a variety of subjects. After all of our speakers there is time to socialise with refreshments. 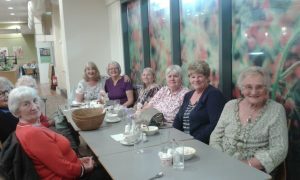 As a WI we have meals out and trips to places of interest. Every year one of our members holds a coffee morning to raise funds for a local charity and there is always the summer strawberry tea! There is also the option to take part in the many activities, outings and events organised by the GFWI (the Gloucestershire Federation). 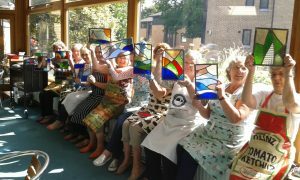 We have the chance to enjoy taster sessions in a range of sports and crafts, take part in the skittles competition or quiz,to go on holidays, or even attend residential courses at WI’s own college in Buckinghamshire. We are a friendly bunch and always welcome visitors who will hopefully become members. Phone Beverley on 01452 613208 or Ellen on 01452 611976 for more information or just pop in on the 2nd Thursday of the month.